HMP The Mount has been delivering GQA qualifications in Fabrication for a number of years; latterly under the banner of A4E. Sean Hayes has been the Centre’s appointed External Quality Advisor for the last 4 years or so and has seen some excellent candidates producing high quality windows and doors that have been earmarked for installation in a number of Prisons around the UK. Unfortunately the workshop at The Mount has, like a great many fabricators from time to time, seen the effects of the recession on their order books. Dave Hunt is employed by A4E as the Assessor for the qualification and as the candidates are only in the workshop for a limited time, Dave and the team have had to use their initiative to keep sufficient throughput of work to develop the skills and knowledge a Fabricator requires even when orders for windows and doors were not as high as previous times. During a recent visit to the Centre Sean was surprised to see some examples of this and when he asked Dave about this he got the following explanation: “With the onset of the recession, work became very scarce and orders were not forthcoming. Due to the lack of work it became difficult for candidates to gain the experience required to improve their knowledge and practical skills”. What could have been a demotivating factor strangely had the reverse effect and because of what followed the workforce became more innovative and it also improved their team working and problem solving skills. The workforce, aided by the instructors, came up with some quite novel ways of keeping themselves busy by designing and manufacturing various items using obsolete or reclaimed extrusions and glass units. These items include a Home team and Visitors team dugouts for the Rugby Team (pictured above). A second set was manufactured and donated to a local amateur football team and is in regular use. Other items designed and manufactured include shower cubicles, telephone boxes, display cabinets, seating benches and coffee tables. 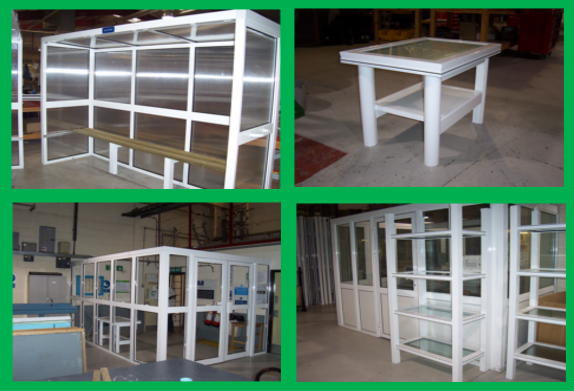 All these are in regular use; it just goes to show the workshop is not confined to manufacturing just windows and doors.